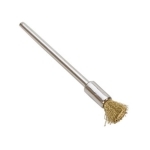 End brushes fit directly into flex-shaft units for difficult cleaning jobs in tight areas. All have a 3/32 arbor and 3/8 diameter heads. Sold 1 per pack or 12 per pack.